I had this feeling that I needed to create something really Christmassy. 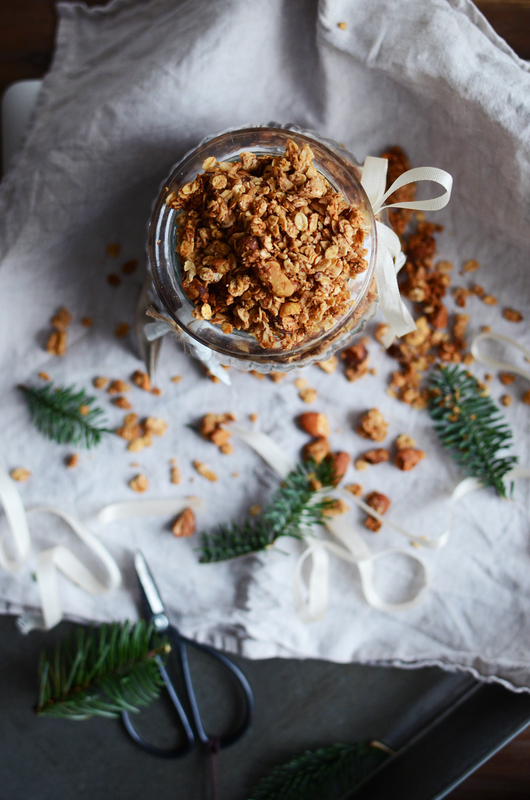 And from that feeling, this gingerbread granola happened. 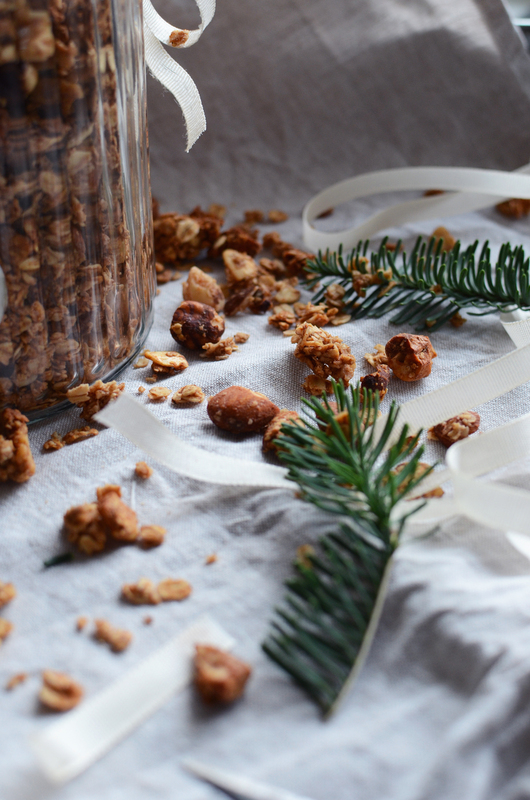 As I’ve done in the previous couple years, I decided to give granola as a gift this year too. But instead of doing one of my go-to recipes, I wanted to try something new. And I’m glad I did, because this one turned out great. It’s really good. Actually so good, that I’m not even going to mention how many times I’ve gone and taken just a bit of it while writing this. As it would be kind of embarrasing to tell you how many breaks I needed to write this sentence. And just to add another word of warning, there will be this really lovely scent in your home after making this. So be careful. 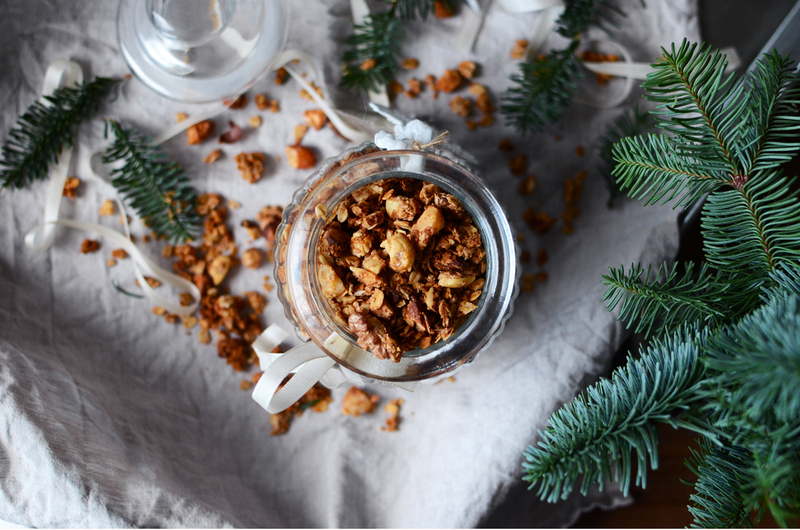 Even though I just made this lovely granola and it smells like Christmas in our apartment, I haven’t really got that into that Christmas feeling. I totally forgot to listen to Christmas songs so I tried to cover it this week by listening to them non stop. That wasn’t such a good idea. We don’t have a single christmas decoration in our apartment as we’re moving in between christmas and New Year’s and it felt a bit foolish to buy something to this place. So I’ve just been missing glögg (traditional Finnish Christmas drink, it’s like mulled wine), gingerbread cookies and my mom’s Christmas decorations. Or maybe I’m just remembering all those white Christmases that lasted for ages when I was a kid, and everything feels a bit dull compared to those memories. Even thought that Christmas feeling is still hiding somewhere, I’m really looking forward to Christmas. Cooking and baking, talking and spending the whole day in my pyjamas, reading and of course eating good food. Luckily these thing can be made no matter where you’re spending your Christmas or what’s the weather like. Christmas traditions, those familiar things and all the same old decorations are nice. But then again, sometimes it’s really relieving to forget all those traditions and try something new. Spend the holidays abroad, invite new people to spend Christmas with you or try a totally new menu. So instead of all that pressure that’s lurking around we could just focus on the things that we truly enjoy. 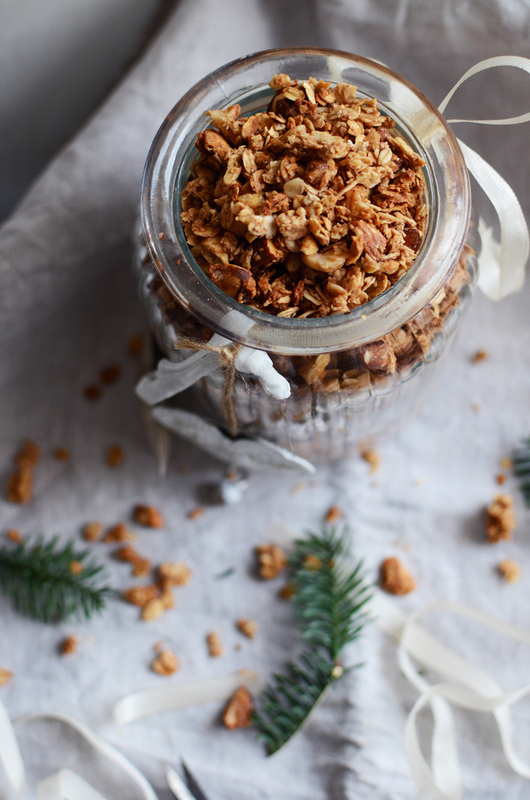 Like in this gingerbread granola, which is a perfect substitute for making gingerbread cookies. And you’ll also get a couple nice gifts from it too at the same time. And maybe while we’re doing those things that we really like and enjoy, the feeling of Christmas will come to us just naturally, without all the fuss. I didn’t have the energy to make gingerbread cookies this year, but after seeing so many pictures in Pinterest, I knew that I had to go out and buy those damn gingerbread spices. But instead of doing the traditional cookies, I wanted to make a granola. And now while I’m munching on the granola, I’m wondering how I haven’t made it earlier?! I can honestly say that this is one of my favorite recipes already, so if you’re in that kind of a gingerbread craving state as I was, this will save you. 1. Preheat the oven to 150°C / 300°F. Crush the nuts a bit into smaller pieces. In a large bowl, combine all the dry ingredients and spices. Mix well. 2. Warm the coconut oil and honey on the stovetop until runny. Add it to the dry ingredients and mix carefully. Transfer granola to prepared baking sheet and spread into an even layer. Bake for about 35 to 45 minutes, rotating halfeay through. Let cool completely before serving and storing in an airtight glass jar. Tagged christmas, gingerbread, granola, snacks, treats, winter. These Raw Almond & Blueberry Chocolate Treats are delicious and full of superfoods that will satisfy your chocolate cravings and make you feel great! Ohhhh story of my life, hah! I have a habit of crunching on tiny little pieces of food (the crispier the better), so I know this would be a dangerous recipe in my kitchen :D Such a wonderful addition of cardamom, and coconut oil is one of my favorite fats for cooking! Oh yes, the crunchier the better:) And more dangerous! This is a delicious recipe even if I say so, but be careful ’cause it’s so addictive! I’m glad you liked it and thanks for commenting!